It is an unlikely friendship - one that has amazed their owners and animal experts alike. 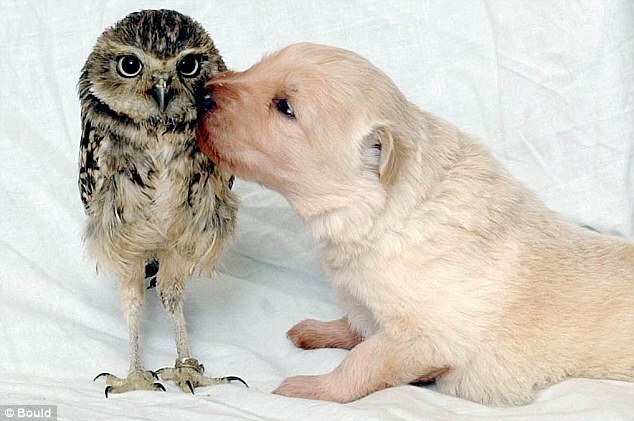 Yet, somehow, this baby owl has chosen a dog as his best friend. 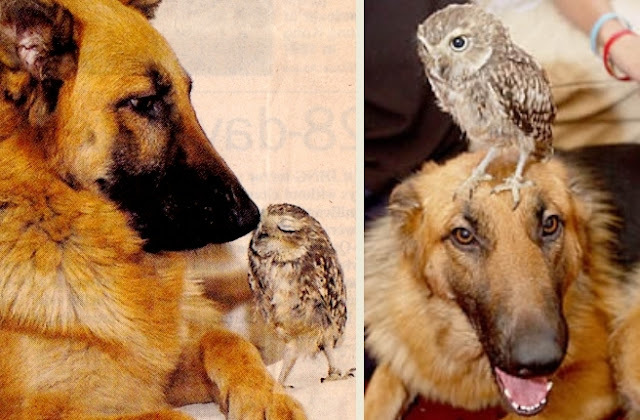 Boobah the owl and Hazel the German shepherd have become inseparable, with the bird regularly perching on the dog's head or back for a ride. Their owners, Stuart and Caroline Ward, bought Boobah three weeks ago, just before two-year-old Hazel gave birth to two pups. 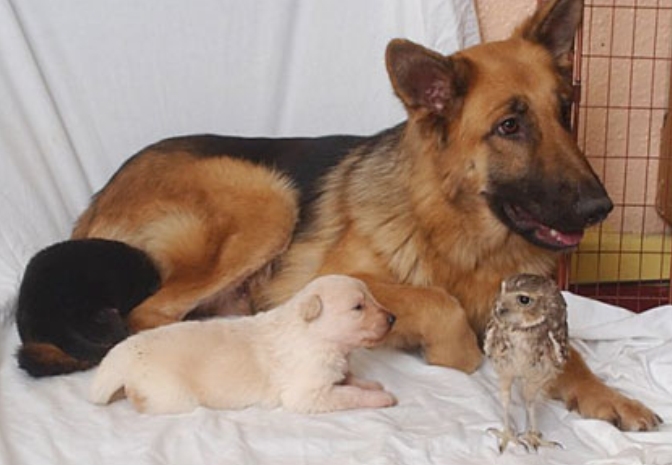 They feared the dog might be over-protective of her litter and suspicious of the new arrival. Instead, she welcomed her new feathered friend into the fold. Boobah even tried to suckle milk from his 'adopted mother'. Mother-of-six Caroline, 33, from Shrewsbury, said: "They are the best of friends. It is amazing to watch them because they literally go everywhere together. "When we first bought Boobah back home with us, I don't think Hazel knew what to make of him. Boobah hopped over to her as she was feeding the pups one day and I was expecting her to growl or bark at him to shoo him away. But she didn't - she let him come right up close. We regularly see Boobah cling on to Hazel's back as she takes him for walks around the house. "It's adorable but so unusual. Anybody who comes to visit can't believe their eyes." 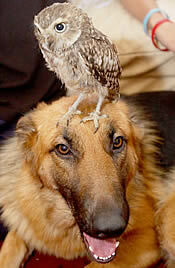 The RSPCA in Shropshire said friendships between dogs and birds were almost unheard of, as they would not normally meet. 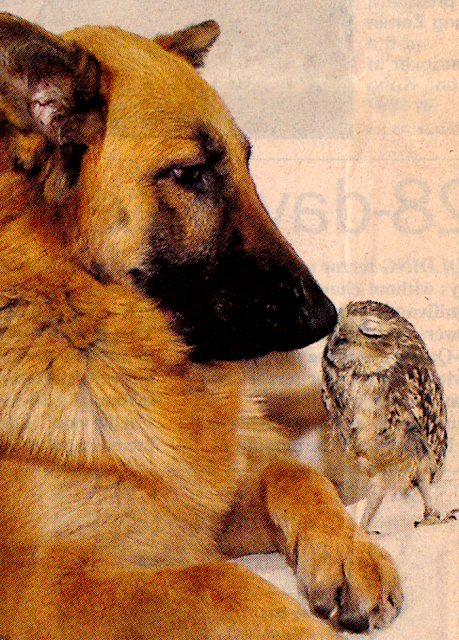 A spokeswoman added: "It is extremely unusual for an owl and a dog to have such a close relationship." Responses to "Best of friends: Boobah the owl and Hazel the German shepherd are inseparable"